Want to know the real reason behind this post? To help me save time on blog reviews. I’ve reviewed roughly 75 blogs over the past 6 months–and every single blog I’ve looked at runs into the same problem. So let’s dig into what the heck that means, and why it’s important. First, the goal is to collect loyal, trusting, raving fans. And we want to nurture them starting with random website visitors (i.e. new traffic). Without nailing this, that journey will never take place for most blog visitors. 1 – “What” is your blog about? If the name of your blog is “Personal Finance for Dummies” or “Problogger,” people might get a great idea. But what if you’re domain/brand name is your name? What if your name is Busy Budgeter, but you also talk about multiple sub-topics that aren’t budgeting? 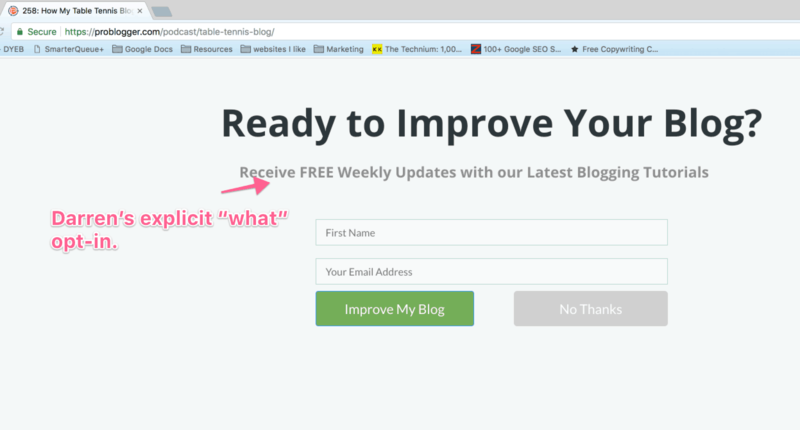 Don’t you think you should explicitly tell people EXACTLY what you blog about? 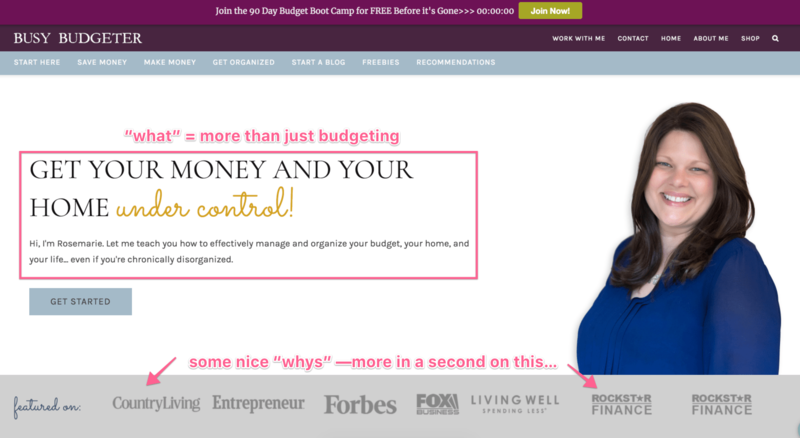 FYI that’s Rosemarie, founder of Busy Budgeter, a $1M+ blog. Here’s her story! Your job as a brand-builder and true-fan-magnet is to inform new website visitors EXACTLY what your blog and brand is about. What you teach, share, and sell. Make it easy for people to learn this information. Your homepage, and possibly your about page. Tell people what you do. 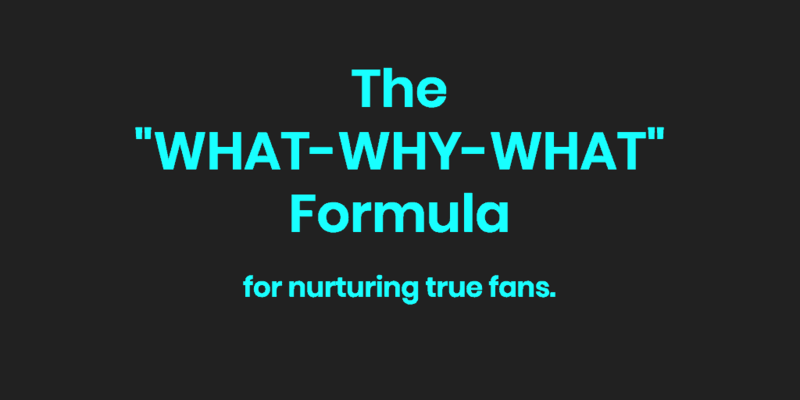 2 – “Why” should we follow you–rather than your competitors? But there are 1,823 other personal finance blogs out there. Why should people follow Bobby as opposed to everybody else? Apply everything I’m saying to your own niche FYI. There are tons of other blogs like yours. There are two main ways to convince visitors why they need to follow YOU: Authority and your unique story. Authority = People want to know that YOU know what the heck you’re talking about. Your unique story = something none of your competitors have. Bobby’s story above is that he paid off $40k of student loans over 18 months on a teacher’s salary. Home page, about page, sidebars, email opt-ins. Show people why. Most of DYEB’s “why” is my story. I’ve started over 45+ online businesses and blogs, failed a lot, and have a ton of stories for learning to share. I might actually be OBSESSED with blogging and online business. My passion for this helps me stand out. I quit a cushy job to be broke for a while and make this whole online business thing work. I made $18k in my first year, and on track to triple that in year 2. 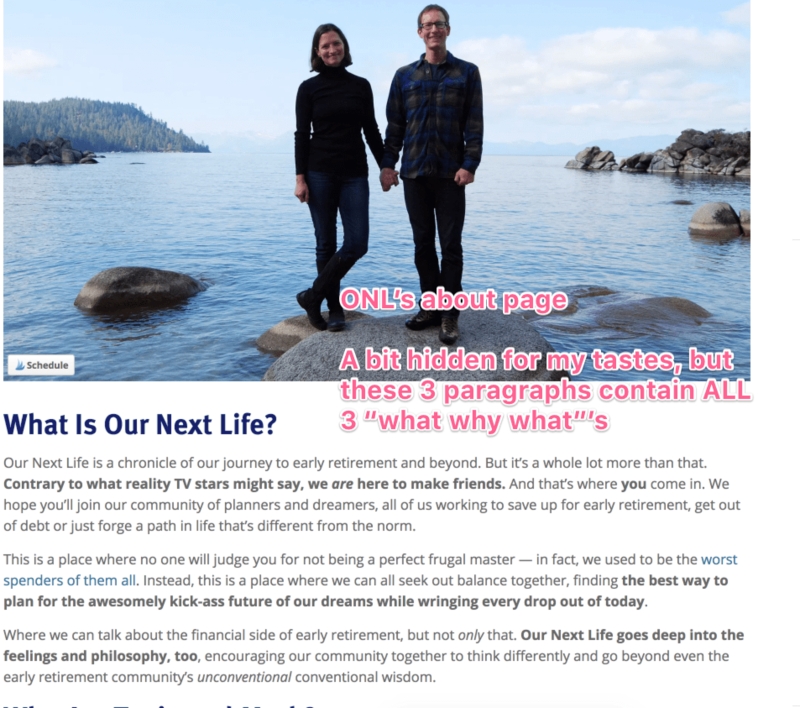 3 – “What’s” in it for me (a new website visitor)? Seriously though. What’s it in for me to read your blog post? Literally, what am I going to get? What’s it in for me to opt-in to your email list–especially since I’m on 10+ other newsletters in your niche? Tell people, in the most explicit of terms, exactly what they will get out of being a follower of [your-blog-name]. Tell them what’s in store if they stick around. Go back and remember our goal. My job as a blogger is to turn cold website traffic (new visitors), into loyal repeat visitors, fans, and customers. 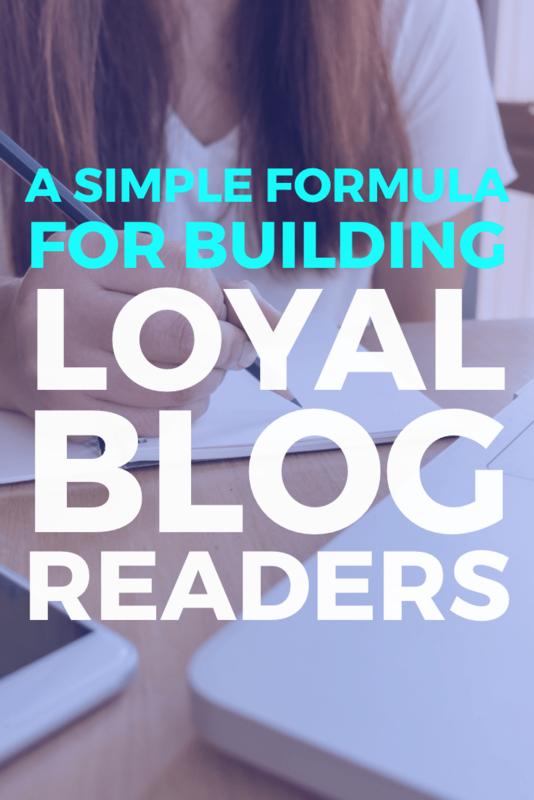 You don’t make tons of money from your blog from brand-new website visitors. You make them over time from loyal fans. Sharing your “what why what” is the very first step to turning first-time visitors to repeat visitors. judgment-free finance and friend-making. Their core purpose attracts their core audience. what they’re going to GET out of being a follower. So tell them, in as few words as possible, as quickly as possible, all across your blog. Go forth and nurture true fans. But before you do, drop me a comment and say hello below! thanks for sharing this tactic. I’ve tried to implement it and I’ve also offered some freebies to gain subscribers. The only problem is my unsubscribe rate. People sign up, download the freebie, then unsubscribe the same day. Any tips on how to prevent/fix this? 1 – don’t fret about unsubscribes. They’ll always happen. 2 – Are you sending multiple emails the same day? Ask yourself WHY people might be unsubbing. 3 – Focus on creating long-term value, and literally tell them why they should stay connected with you. This one’s tricky. Great article, Pete! When I post the show notes of your interview on my podcast, I will definitely link to this article. You gave me this advice on the episode and here it’s all drawn out. Thanks! Very helpful. Totally. I’ve said it a ton recently. This was a nice short read on What Why what. Thanks for summarizing it for us Pete! Excellent advice! I feel like no matter your blogging goals, be it money, community, accountability, this is a great outline to follow. Hard to continue to blog without regular readers to interact with. Probably the #1 reason bloggers quit in year one. No “perceived traction.” I.e. nothing to make them feel validated for their efforts. Hi Pete, great advice, your really need to sit back and reflect on what your doing! It’s given me some great food for thought.